This simple recipe is packed with vegetables and can easily be adapted to your family's tastes. Use whatever canned vegetables you find in the pantry or change it up by steaming your favorite fresh vegetables. It's a great home-cooked meal for evenings when you don't have much time to cook. In large pan, brown the ground turkey, adding a few dashes of garlic salt. Remove from heat and drain grease from the cooked turkey. Wash red potatoes and poke holes in them with a fork. Wrap half of the potatoes in a clean, wet dishtowel and cook in the microwave for 3-5 minutes, until soft. Repeat with the rest of the potatoes. Mash potatoes roughly with a fork, leaving the skin on. Add salt and pepper to taste. Pour browned turkey into the bottom of a 2-quart casserole dish. Add layer of diced tomatoes, including the juice. 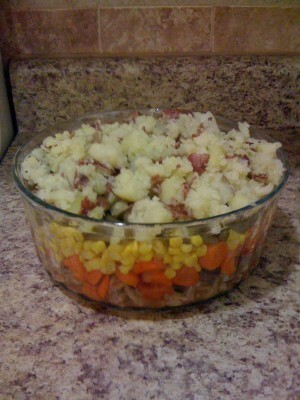 Drain the canned vegetables and add a layer of each one to the dish. Top with layer of mashed red potatoes. The top and bottom layers of the dish will be warm. Warm up the middle layers by microwaving the dish for 2-3 minutes.